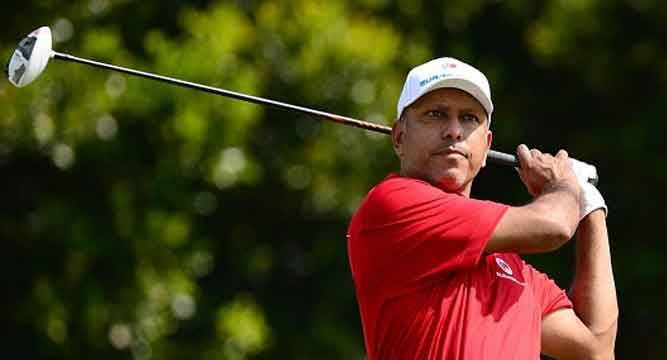 Jeev Milkha Singh showed glimpses of his old form with a round of 69 that took him to tied 22 at the end of the third round of the True Thailand Classic, presented by Chang. Jeev is now six-under but is eight shots of the leader, Scott Hend (68-64-70). He was tied 49 at the midway stage after Friday’s second round. Jeev has been hit by injuries and loss of form that saw him make just one cut in his last eight starts since finishing tied 24 in Hong Kong. Meanwhile, Chiragh Kumar and Rashid Khan, who were both tied 9th after the second round, slipped down the leaderboard. Chiragh after shooting 68-68 on first two days, was blown away by the wind to four-over 76 and dropped to tied 34. Rashid shot 73 and is now tied 16 at seven-under. Gaganjeet Bhullar (73-68-70) moved up and is now tied 28th at five-under 211. Himmat Rai (68-72-72) was tied 34 and Arjun Atwal (69-72-74) was tied 57. Australian Hend birdied two of his closing four holes to open up a two-shot lead after a wind-swept third round. Chasing an eighth Asian Tour victory, big-hitting Hend battled to a two-under-par 70 at the Black Mountain Golf Club to lead from American Peter Uihlein, who came home in 69 at the USD 1.75 million event sanctioned by the Asian Tour and European Tour. Thomas Pieters of Belgium shot the day’s best of 66 to lie three back of Hend, who was also the third round leader in the inaugural edition before finishing joint runner-up last year. Co-overnight leader Pelle Edberg of Sweden made two closing birdies to salvage a 73 to lie alongside Pieters, while Thai duo Prom Meesawat (69) and Panuphol Pittayarat (74) ended the day in joint eighth place, five off the pace. Swirly winds kept the leaders bunched together for much of the day before big-hitting Hend brilliantly chipped in from the fringe for birdie on 15 before setting up another easy birdie on 17 by using his length to great effect where he nearly drove the green. First day leader Uihlein, who has finished top-10 in his last two starts, bounced back from sickness with four birdies on the card in his bid for a second European Tour victory.